Dentists belong to health professional category who help to take care of teeth, gums, bones related to the mouth. They treat diseases of teeth and also guide in preventing disease by cleaning, treating certain conditions. They instruct patients about dental tips, health, hygiene and diet to be followed. If you have pursued your course in dentistry and look forward to work in a dental clinic, you need to know what sort of dentist interview questions you would face. Before attending a dentistry interview session, you need to make a list of the previous cases you have handled, a list of the procedures you have practised, certification copies, recommendation letters, and references if any. 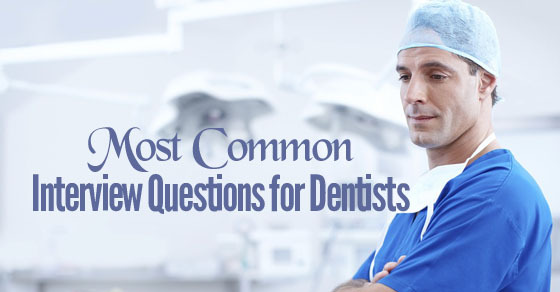 The following mentioned are few important and common dental interview questions for dentist. For the educational details you would need to provide information about the higher secondary certification, your undergraduate and postgraduate certification, and where you had done it. Besides, if you are member of various organization and other social sites, do indicate them so that they know that you are professionally updating yourself. Now here you need to mention about why dentistry over medicine and why you had taken it up. It could be inspiration of your uncle or a parent or sheer passion to pursue this field. Give a brief on why you intended to continue with this course. You could indicate which subjects were of profound interest referring to the grades. Through that you could indicate which subjects motivated you to study better and improve yourself, get to understand the concepts. Everyone’s learning phases are packed with different learning experiences, so bring out those experiences in brief. This is a general interview question that is posed to know from one how they are as a person. These personality traits helps to identify those qualities required for the sector of service. You should describe about your communication skills, positive attitudes, how you answer and brief on patients conditions, tackling sensitive issues, what motivates you, who is your inspiration, etc. As you might need to work with other dentists, they would be interested to know if you prefer to work alone or in groups. If you have worked with groups, then describe about the consultations, reviews with other dental hygienists to show that you work in co-ordination. If you have worked most of the time alone, then describe that you haven’t had an opportunity to work in groups and prefer to work alone or if interested to give you a chance to work in group. Also describe some of the necessary traits like team work, no ego, self-confident, sharing attitude, co-operation, positive mind-set, compromising, helping out, appreciating and supporting in whatever way possible. You need to indicate what weak points you have noticed earlier and how did you correct it. What steps you had taken so that you could avoid them. This may seem awkward but you could even suggest that you focussed more on the strengths rather than the weakness. You could say with pride that you are a learner and intend to learn from the mistakes. This is the time when you need to explain about the ones you have studied and practiced. Tell them about the teeth bonding and how the composite resin that fills the gaps and covers the stains and chips, is dried using high intensity light. You could describe the tooth contouring, reshaping procedures. Also give a glimpse of tooth whitening, bad breath treatment, about use of mouth guards and fixing of crowns. As a dentist you would be most of the time interacting with patients who come around for correcting alignment of the teeth or for treating a tooth. In any case, you have to be sure of the precautions to be taken. You need to describe the way you would instruct them for some with the examples. Like for alignment the patient may be treated by wearing clips of braces. In such cases you would be providing how to take care and what to use. These are the type of details that they would be looking to hear from you, when posed with some dental hygiene interview questions. Being a dentist, mostly you would be involving to diagnose a patient. If you have assistants with you, you would need to assure that no diagnosis goes without your involvement. You also need to specify, that only for sake of consulting for specific cases, diagnosis involves another senior professional. As this would have been part of your study and practice, explain what steps are required and mandatory to be followed to disinfect the equipment. What ways the instruments are to be handled and cleaned before a procedure or after a procedure. Explain a little about the monitors of sterilization, clinical waste disposal and how the sterilized instruments should be stored. Here you could display your skills of managing administration of office like other sectors. If you have kept an assistant to help you out then explain in brief as to how you trained him/her and also get all the issues sorted out, when asked few dentistry interview questions. You need to be aware of the latest trends or what has been commonly practised. Describe a little about the biomaterials used as dental implants that can replace a missing tooth and technique for implanting. Also describe the way root canal technique is done. Make a note on the type of fillings used for dental filling, what ways are the scaling and cleaning is done. You could explain as to what is the most inspiring part of dentistry like correcting a teeth alignment or having to a filling. Also you could give reasons as to giving you a flexible lifestyle and being your own boss when compared to other health profession. Besides sometimes looking into others mouth is the least liked of it. You would need to provide a relation between oral health to overall health by providing examples of link between gum disease and heart disease and its link to diabetes. Also describe its link with respiratory diseases, rheumatoid arthritis, and osteoporosis. Give a brief about the relationship that you would have learnt from surveys done worldwide. Sometimes, you would not have had an increase in salary or there are not many type of cases you have encountered. You may be using the same procedures without being exposed to other practices that is necessary for your growth in this field, this could cause you to look out for new job. Just emphasis the reasons with main intentions of not having exposure to trends and getting opportunity to witness or practice with new technology. There are many ways that you would have gained knowledge, either through your co-workers or while working in big clinics. Even getting information through magazines or subscription with e-magazines helps one to gain knowledge about the trends. Speak about the interactions you have with other friends who are in your professional network as interactions are mainly intended to get a doubt cleared. Often there are situations when a patient may feel discomfort about the whole procedure or afraid about the pain that is to be encountered. You need to explain as to how you would have counselled the patient esp, if the patient is child and what steps you had to take to avoid any discomfort that would have aggravated the situation. Here depending on your desires you could explain. If you want to gain more experience in this field, then you could get into this for little bit longer but if you prefer to switch to having your own then show your commitment to working for certain period of time. Every individual have personal goals to satisfy be it for their family or for themselves. Here you elaborate what are your personal goals that you are aiming for. Whatever be it describe with smart objectives indicating that those goals motivates you. For this you could give examples of your work during your earlier academic years that could be even those that you participated during your school days as well. You could indicate what activities you were involved with, which part of the work you were interested in. You may explain the skills you had learnt like public speaking, co-ordinating sub-committees, training others, writing reports or newsletters, planning projects, during the phase of work. There may have been a cause that you had worked towards to raise a fund. But be honest when stating those activities without over exaggeration. Now these are activities that are mainly your hobbies. As said hobbies are activities or interests that are done in leisure time for pleasure like gardening, painting, drawing, collections, watching movies, listening to music, reading books, etc. They would come to know about your creativity and what inspires you to do when free. Being in professional field of work, you would be associated with other non- dental groups. Give examples of your memberships with other groups and how long you are associated with them. Also include what activities you had been involved like attending seminars, workshops, conducting awareness sessions, etc. Explain the terminology of patient flow indicating that improving them would directly improve health services. It can be improved through services matching the demands, treatment times, care given, right diagnostic pathway leading to right treatment, timely decision making, prioritising treatments, reducing queues, sharing staff resources for similar work, first in first out, reduce waiting time for patients treatments unless clinically required to. There are many questions you could enquire. Get to know about their intentions for you, what technology they use, whether their practise would grows, what types of treatments they use, what would be your role in their group, whether they market or depend on referrals, what are their policies, what type of treatments offered, what are their goals for you. Being curious is definitely fine but don’t go overboard. These are some of the common dentist interview questions and answers, you would need to bear in mind before getting to the interview session. Each time you say something about yourself or describe your skill give examples wherever possible. Let your words be clear, concise and honest, and do not forget to quote references. Show enthusiasm and interest in all your remarks. You are sure to gain respect at the end of the session.